Housekeeper Earlene Roberts, to a radio reporter on the afternoon of the assassination, stated that Oswald was wearing a "short gray coat" as he left the rooming house. She told the FBI that she remembered Oswald putting on a jacket and zipping it up as he went out the front door, adding that it was the type of jacket that zips up in the front. Helen Markham, standing at the northwest corner of Tenth and Patton, testified to the Warren Commission that the cop-killer (who she positively identified as Lee Oswald) had on a short jacket that was open in the front and was grayish-tan in color. Domingo Benavides, passing by in his pickup truck, saw Tippit's patrol car stopped near the curb and stated that the officer (Tippit) was talking to a man on foot. Benavides heard the shots and saw the killer run from the scene. Benavides testified to the Warren Commission that the killer was wearing a light-beige jacket, and that the jacket was lightweight. William Scoggins, sitting in his cab (facing north on Patton towards the intersection with Tenth Street), was eating lunch when he noticed Tippit's patrol car travel from west to east on Tenth Street, crossing through the intersection with Patton. Scoggins saw the patrol car come to a stop and noticed the officer having a conversation with a man who was walking on the sidewalk. Scoggins heard the shots, looked up and saw the man running towards his cab. Scoggins got out of his cab and hid beside it as the cop-killer passed. 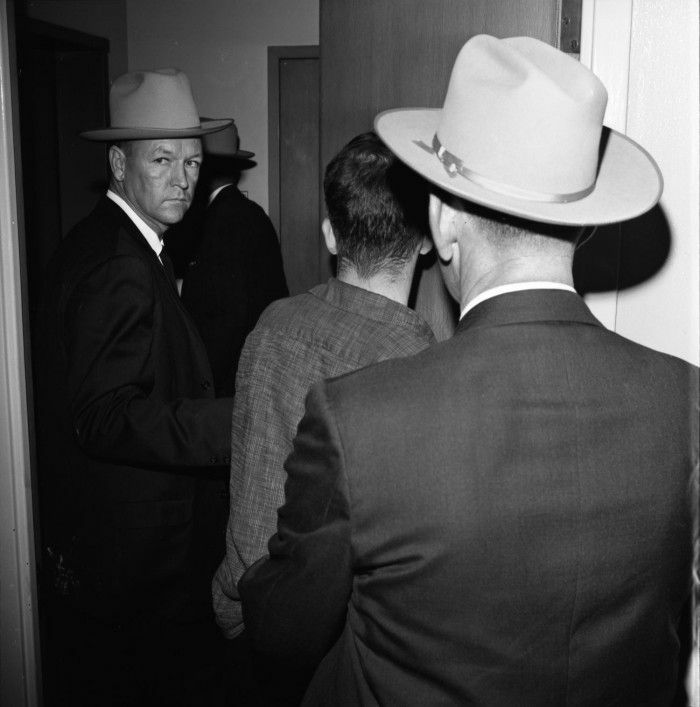 He (Scoggins) testified that the man (who he positively identified as Lee Oswald) was wearing a jacket. Barbara Davis was inside her house on Tenth Street (400 East Tenth St.) at the corner of Patton Avenue when she heard the gun shots. She went to her front door and noticed a man (who she positively identified as Lee Oswald) cutting across her front yard, heading towards Patton with a gun in his hands. She testified to the Warren Commission that the cop-killer had on a dark coat as he cut across her yard. Virginia Davis was inside the same house on Tenth Street as was her sister-in-law, Barbara, when she heard the shots. Virginia went to the door and saw a man cutting across the yard with a gun in his hands. Virginia testified to the Warren Commission that the man (who she positively identified as Lee Oswald) had on a light-brown-tan jacket. Ted Callaway was on the front porch of his office near the alley between Tenth and Jefferson when he heard the shots come from the vicinity of Tenth Street. He saw a man (who he positively identified as Lee Oswald) cutting across the yard of the house on the corner (Barbara and Virginia Davis) and noticed William Scoggins ducking beside the cab as the man passed, running down Patton from Tenth, holding a gun in his hands. Callaway stated that the man had on a light tannish-gray windbreaker jacket. Callaway testified to the Warren Commission that CE-162 (the jacket found on the ground under a car at the Texaco lot) looked like the jacket that the man was wearing as he was running from the scene. Sam Guinyard was on Patton Ave. when he heard the shots. Like the others, Guinyard saw the man (who he positively identified as Lee Oswald) cut across the yard of the Davis house on the corner of Tenth and Patton. Guinyard testified that the man was running down Patton with a gun in his hands. Guinyard testified to the Warren Commission that Oswald was wearing sort of a light-gray-looking jacket as he ran from the scene. Warren Reynolds was inside the office at Reynolds Motor Company, located on the corner of Patton and Jefferson. Reynolds saw a man running down Patton with a gun in his hands and turn the corner onto Jefferson. Reynolds stated that he followed the man, who he believed in his own mind was Lee Oswald, and saw him go behind the Texaco Station on Jefferson. A light colored jacket (CE-162) was found on the ground under a car in the parking lot behind the Texaco station. Johnny Brewer was working in his shoe shop on Jefferson Boulevard. He noticed a man duck into the recessed area of the storefront, looking nervous and appearing to avoid the police cars that were racing up and down Jefferson with sirens blaring. Brewer stated that the man, who he identified as Lee Oswald, was NOT wearing a jacket. Why did Lee Oswald ditch his jacket? You mean LHO's "alleged jacket". Domingo Benavides description of Tippit's killer compared to a photo taken of Ozzie on 11/22/63 while in DPD custody. Mr. Belin: Let me ask you now, I would like you to relate again the action of the man with the gun as you saw him now. Mr. BENAVIDES - I remember the back of his head seemed like his hairline was sort of--looked like his hairline sort of went square instead of tapered off. and he looked like he needed a haircut for about 2 weeks, but his hair didn't taper off, it kind of went down and squared off and made his head look fiat in back. Uh, you haven't actually demonstrated that CE-162 was Oswald's jacket or was even ever on Oswald. Mr. BALL. I'll show you this jacket which is Commission Exhibit 162---have you ever seen this jacket before? Mr. BALL. Does it look like, anything like, the jacket the man had on? Mrs. MARKHAM. It is short, open down the front. but that jacket it is a darker jacket than that, I know it was. Mr. BALL. You don't think it was as light a jacket as that? Mr. BELIN - I am handing you a jacket which has been marked as "Commission's Exhibit 163," and ask you to state whether this bears any similarity to the jacket you saw this man with the gun wearing? Mr. BALL. I have a jacket, I would like to show you, which is Commission Exhibit No. 162. Does this look anything like the jacket that the man had on that was going across your lawn? Mr. BALL. How is it different? Mrs. DAVIS. Well, it was dark and to me it looked like it was maybe a wool fabric, it looked sort of rough. Like more of a sporting jacket. Mr. BALL. I have a jacket here Commission's Exhibit No. 162. Does this look anything like the jacket that the man had on that you saw across the street with a gun? Mr. CALLAWAY. Yes; it sure does. Yes, that is the same type jacket. Actually, I thought it had a little more tan to it. 279: We believe we've got this suspect on shooting this officer out here. Got his white jacket. Regardless of whether CE-162 is Oswald's jacket or not (it is), the fact remains that he was seen by a multitude of witnesses (near the scene of the Tippit slaying) wearing a jacket. Why did he have no jacket on when he was seen by Brewer? You've also missed the point. Whether the jacket that Oswald was wearing was white, gray, black or even rainbow colored... he had a jacket on one minute and "15 to 20 minutes" later, he had no jacket on. What happened to Oswald's white/gray/black/rainbow jacket? Oswald was seen by Reynolds and Patterson entering the lot behind the Texaco station. A jacket was found on the ground there. Oswald, minutes later, is seen without a jacket. Regardless of what color it was, why did Oswald ditch his jacket? Dark blue, gray-black and orange-yellow cotton fibers were removed from one of the sleeves of the jacket that was found on the ground in the lot behind the Texaco station. These fibers removed from the sleeve of the jacket (CE-162) match the microscopic characteristics of the dark blue, gray-black and orange-yellow cotton fibers which composed the Oswald arrest shirt. Actually, and even worse, the entire claim that Oswald left the roominghouse wearing a jacket is based completely on the statements of one woman, who by her own admission was paying more attention to getting the TV to work and who her employer warned the WC about as she was known for "making up tales". There is no corroboration for the claim that Oswald left the roominghouse wearing a jacket. If only one person was present when Oswald left the rooming house, how could there be any corroboration? At least eight witnesses saw Lee Oswald wearing a jacket in Oak Cliff and then Johnny Brewer sees him without a jacket. If Oswald did not leave the roominghouse wearing a jacket, then who did those Tippit witnesses see running wearing a jacket? Yet, none of them say that there were two assailants. Therefore, you have to ask yourself what is more likely. 1. Some witnesses saw Oswald flee the scene on one side of Patton and others saw Oswald flee on the other side of Patton (Oswald did indeed cross Patton from one side to the other at some point). 2. There were two assailants, each on their own side of Patton and going totally unnoticed by the witnesses who saw the other assailant coming down the other side of Patton.